I have had a bit of a blog absence over the past week or two but I've had lots going on and I'm looking forward to sharing it with you in my next few posts. I have been to a ladies only networking event with work but it was all about cake which was an added bonus, my parents and younger brother came to visit for a few days and Himself turned 30 last weekend. Lots of baking and partying has been done so I am quite excited to tell you all about all of these things. 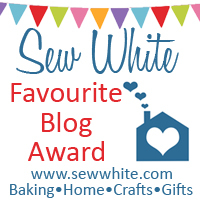 On a final and very exciting note the lovely Sisley from Sew White has given me a favourite blog award!!! I am so pleased about this especially as this wee blog is still very much in its infancy and there are so many other amazing blogs out there. Sew White is a fantastic website for anyone interested in baking or crafting so I suggest you go have a look at it. If I could afford it I would be buying most of their stock!